Great for helping kids reach the sink in the bathroom and kitchen. Use in the kitchen, garage, or laundry room, while cleaning, doing home repairs, or as an aid for children reaching the bathroom sink. Lightweight and strong for kids and adults. 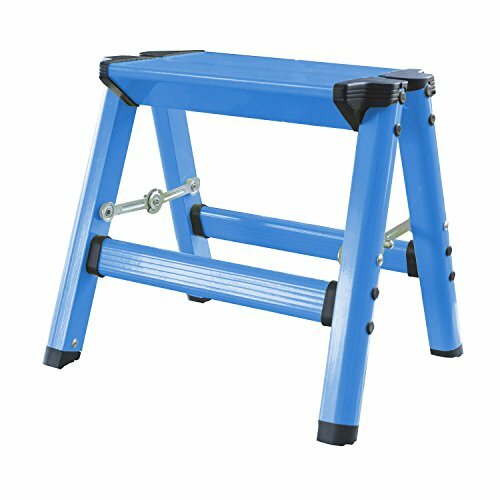 Non-skid feet prevent slipping, tempered aluminum frame. Knob on metal locking brackets make folding for storage easier. Weight capacity: 330 lbs.. Warranty: 90 Days. Made from aluminum. Made in China. No assembly required. Open: 13.5 in. W x 11 in. D x 12 in. H. Closed: 13.5 in. W x 12 in. D x 6 in. H (2.15 lbs.). The colorful AmeriHome Aluminum Step Stool is as safe and functional as it is attractive. In assorted fun and vivid colors, the small Folding Step Ladder is great for giving kids a boost in the bathroom and kitchen. The tempered aluminum frame is tough enough to safely hold up to 330 lbs., but is also ultra lightweight, making it easy for small children to pick up and move. The Single Step Stool also folds to just 6 inches wide, making it easy to stash out of the way in the pantry, or next to the fridge. This Aluminum Step Ladder locks into the open position for safety, but the metal bracket has a small knob that makes unlocking and folding much easier than other designs.